Judy is a retired nurse, Dave is now fully retired too, and loving it. We have two children and two grand children. Speaking from the depths of winter – although touch wood we seem to be doing a bit better than the UK; we are looking forward to the Spring! Our old village in UK, Filkins, has been on the edge of flooding again – although thankfully it didn’t happen. Our old cottage was sold again, and I understand that the new owner watched the water creeping rather too close for comfort. We are very glad to live near the top of a hill. 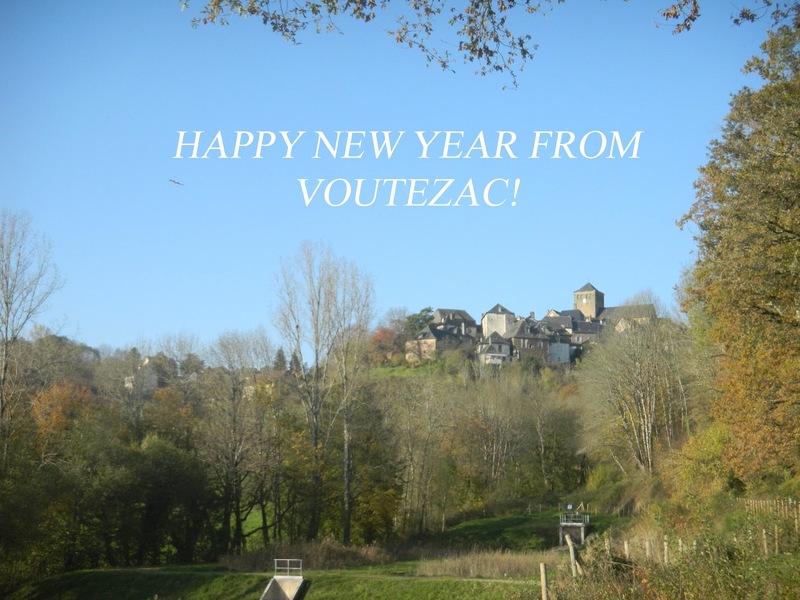 The English Library carries on progressing – we are continuing to attract new members, and we may even try to set up a branch in the nearby town of Uzerche one day. We have so many books in our current room, that we had a day clearing books from the shelves so that we had some room to put back returned books. Buying presents this year we purchased boxes of Brive-made chocolate for a lucky few. The boxes seemed quite small – but they packed plenty in, and the reviews were quite good. Although we have had a number of really nice meals here, you can still get a stinker just as anywhere else. We managed two recently. The first was when we ordered Coq au Vin, which came on a bed of spaghetti – frankly not a match made in heaven. The second was in a local restaurant with a French West African theme – but really poor food and service. Ah well, lots more to try! The weather has been chilly, and when I went to a meeting about half an hour away I managed about every type of weather on the way home – it really varies from place to place, particularly the elevation. It was raining as I left, which turned to sleet, which turned to snow and carpeted the road with a couple of inches – all within 10 minutes of leaving. By the time I got home there was no sign of rain or snow at all. And all on a journey between two places 17km apart in a straight line. I am very careful what I say now- a couple of times I have said how much better our weather was than in the UK – and each time I have woken to a world covered in snow. It has so far thawed very fast, and I hope we don’t see too much more. I had a couple of jobs – both down in the Dordogne. One was for floorplans of some gites, another was for photography. Very nice places and very enjoyable days out. Just before Christmas we finally remembered to go to the carol concert in the village church. It was not an overtly religious occasion – we had a clue when everyone put their umbrellas in the font. There were two choirs singing, one from Voutezac and the other from a nearby village. They were both very good, and we recognised some of the tunes and could join in. WE had “Somewhere over the Rainbow” in English, as was “Deck the Hall”. A few others were sung to tunes we knew. All in all a very enjoyable evening. For Christmas we had two visitors, Rachel and our friend Diane, with her dog Florette. Everyone seemed to get on – although I wouldn’t say our two dogs were over the moon at having another dog in the house. As always Judy and Rachel provided us with some wonderful food. For me it was slightly spoilt by spending Boxing Day and the 27th in bed as I had picked up what I think was the NorvoVirus which has been going around. Still it meant that my diet was not spoiled by Christmas over indulgence – in fact I actually lost some weight. We even had some oysters – which I managed to open with no loss of blood. The spirit of merriment was also slightly blemished by the failure of our freezer just before the big day. A local electrician came out on Boxing Day and took it away for investigation, and brought one with him for us to use – which I was quite impressed with. Ours was beyond economic repair, so we bought a new one from them. Our New Year was as quiet as normal – all the fun of calling our son Nick’s mobile to hear them all enjoying themselves (at 11 their time), then promptly wishing each other a Happy 2013 and going to sleep at midnight our time. We found a really nice restaurant in Brive – actually recommended by a friend. It’s called Chez Francis and apparently resembles a Parisian Bistro. Anyway the food and service are very good, and customers have written their comments and drawn cartoons on every available wall and ceiling space – great fun to try and translate. It was so nice we went back for Judy’s birthday. 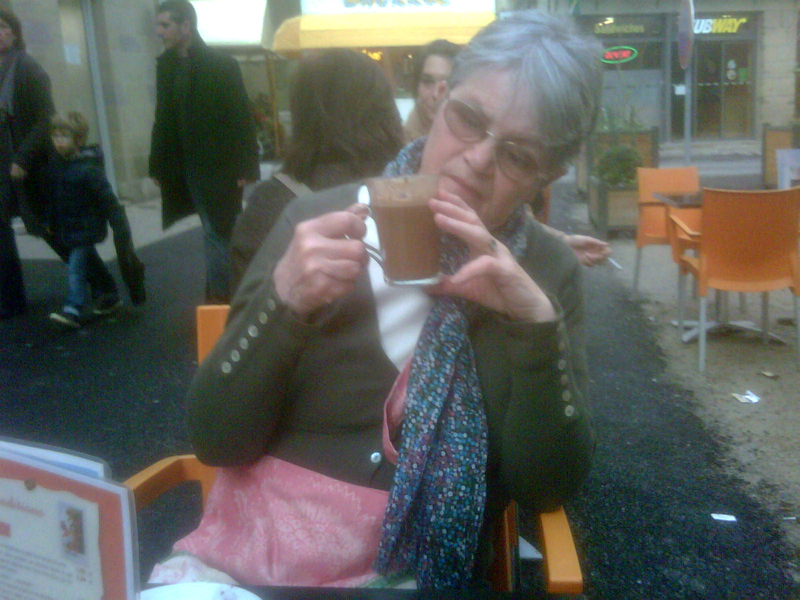 We went to Brive yesterday, and were able sit outside to have a hot chocolate, with Judy wearing her favourite presents. Early in January the clutch went on the car – of course an item not covered in the guarantee. Eventually got the car picked up and taken to the Alfa dealer in Brive. Being without a car was a real pain, so hired one for a few days. The Alfa people were very friendly and helpful….just really expensive. Two days ago we found a puncture on the car – managed to loosen the wheel nuts tightened by a very strong mechanic, but couldn’t get the wheel off the hub. Called out my friendly garagiste from Objat – Jean-Louis, who came up, got the wheel off, took it away and repaired the tyre. He then took all the wheels off their hubs and greased them – just glad it all happened outside the house and not by the side of the motorway in the pouring rain. As we had spent so much time in we went out for a drive as the weather was so nice and took in a few villages, including St Robert – justly famous for its views.